For all Africans and people around the world who want to transact with each other — because "Bitcoin makes it possible"
I'm Ahmad Al-Hemmally, known on the Internet as @ahmadmanga — hobbiest, game dev, and a Bitcoiner from Libya. In October, I wrote an article about bitcoin in my country. Since then, I've found a lot of ways to get the most out of it, through services like BTC Virtual Cards and Zapchain. I was going to write an article about these things, until one thing stopped me. The reason I love bitcoin so much is because it's a decentralized global currency that no government can control. 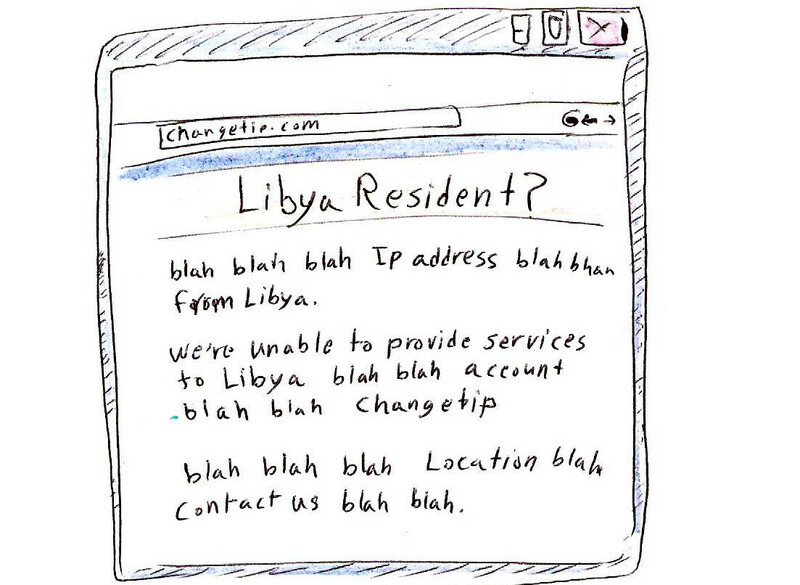 For someone from Libya, whose country is behind in banking, and full of political problems, it's a dream come true. But I forgot that while bitcoin isn't tied to a country, the companies that offer bitcoin services are. One day, I tried to open my ChangeTip account, but I couldn't log in. I messaged the ChangeTip team and they told me that for some reason my account was banned, and after few messages back and forth, they figured out that the problem was related to my geographic location. 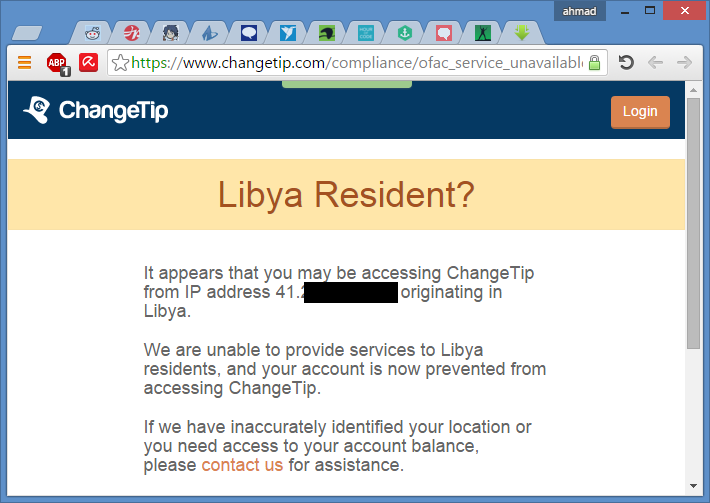 Because of the relationship between the United States and Libya, ChangeTip can no longer offer its services to Libya. I was shocked when I discovered this, and it took me few days to get over it. Fortunately, they withdrew my bitcoin balance on their site to my main wallet, so I didn't have to worry about losing my bitcoin, but I'm still sad. ChangeTip is the leading company in bitcoin tipping. Their "love button of the Internet" spreads over some of the largest social media sites, and many people are introduced to bitcoin through ChangeTip. ChangeTip is a US-based company and it has to follow local laws, so some countries are off-limits for them. Even thought they want to, they can't offer services without risk facing "severe penalties." The problem is bigger than this, however. ChangeTip is the way many bitcoin users send and receive bitcoin. People automatically think that if you're bitcoiner, then it's okay to tip you via ChangeTip. The tipper won't think that the receiver may live in a restricted country. This changes now. When going on social media to tip someone that you don't know, you'll have to worry about whether they can use ChangeTip from where they are, and the thought of that alone is discouraging. This experience reminded me that ChangeTip is centralized, and it reminded me why bitcoin was made in the first place — to be decentralized. With a normal bitcoin address, there's no need to play by the rules of a third party when sending or receiving funds. Being free of government controls, you won't be shut down for political reasons. Bitcoin is a revolution in decentralization, and all bitcoin services should be decentralized! "Changetip has been looking to decentralize for four months now. If we want to keep ChangeTip functionality — money on social media, bitcoin on social media — we need to figure out how to not hold custody of funds, so this never happens again. We are working on it." I heard they're working with the Blockstream and Lightning teams to find a solution. Bitcoin isn't the same without ChangeTip and it will take me a few days to get over this, but I'll still be a bitcoin user. I love this community and I don't hate ChangeTip for being unable to support my country. I've found a few ways to bypass this restriction. 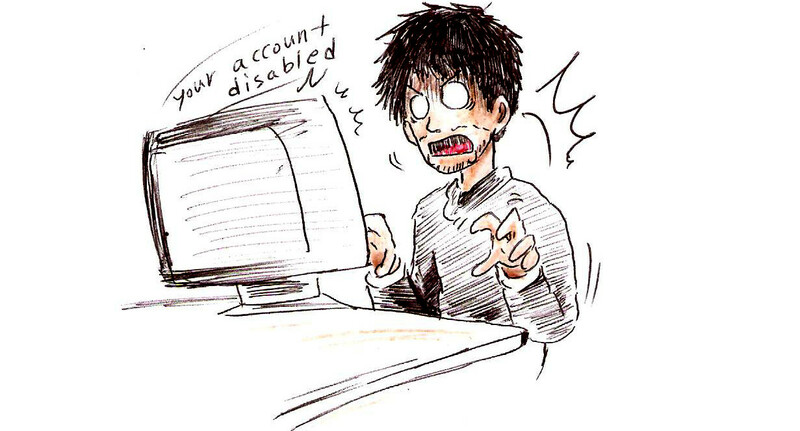 Since the website checks your IP address, you can avoid being disabled by using IP changers, but you can't use your old ChangeTip account. And cheating isn't my way of doing things anyway. Can ChangeTip return to what it was before — a worldwide bitcoin tipping service? I wish, but it'll be hard and it won't happen soon. It's sad and frustrating! Bitcoin isn't the same for me without ChangeTip. Hopefully, the ChangeTip team will keep searching for a solution. According to Victoria, they want to decentralize, because they truly want to be a global company. I'm sure they'll succeed. With bitcoin, it's possible. Until then, I'll keep waiting and supporting the bitcoin community.